• Collect the KNIFE, RULER and PAN highlighted in blue. • You’ll come back later to finish the location. • You’ll go to the Workshop. • Collect the PIN highlighted in blue. • Heat the water in the PAN (A). 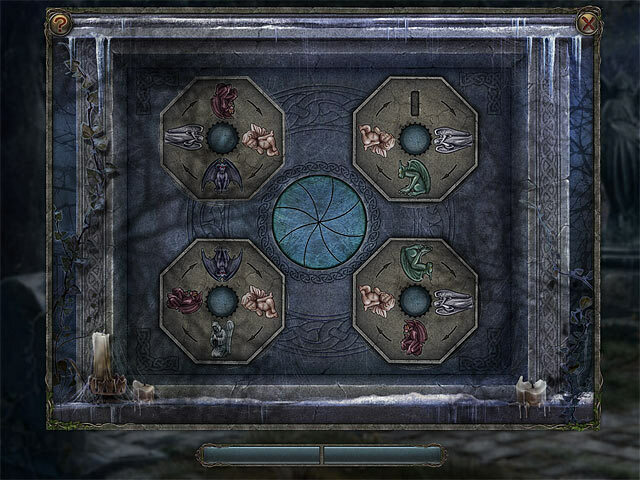 • Click on the wall to activate the puzzle (B). 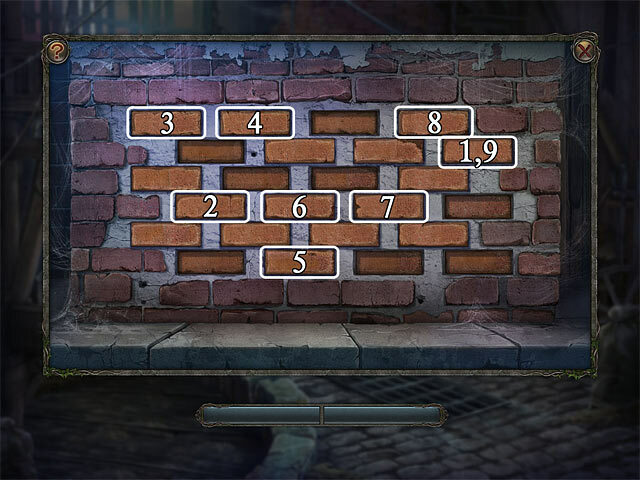 • Click the bricks in the right order to push all of them into the wall. • When you move your cursor over a brick, it highlights the bricks that will change position. 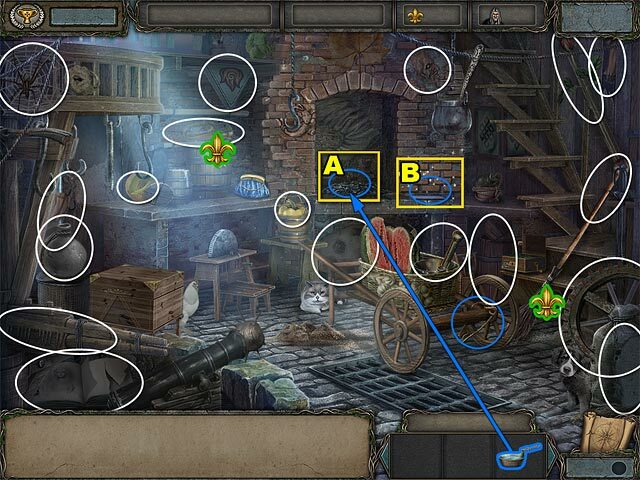 • Follow the numbers on the screenshot to solve the puzzle. 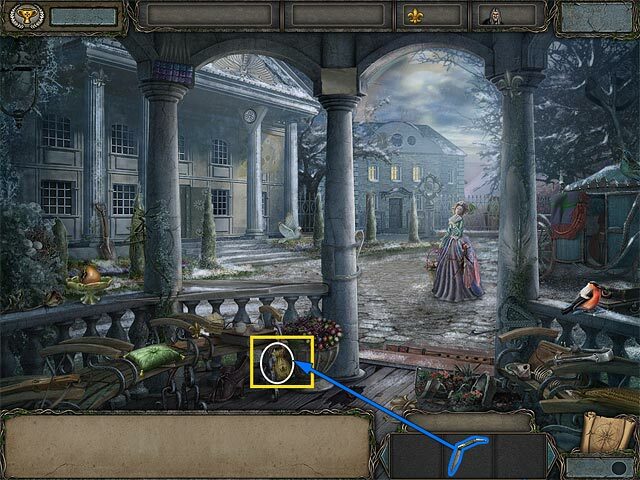 • Use the map to go to the Mansion. • Collect the AXE and the BERRIES highlighted in blue. 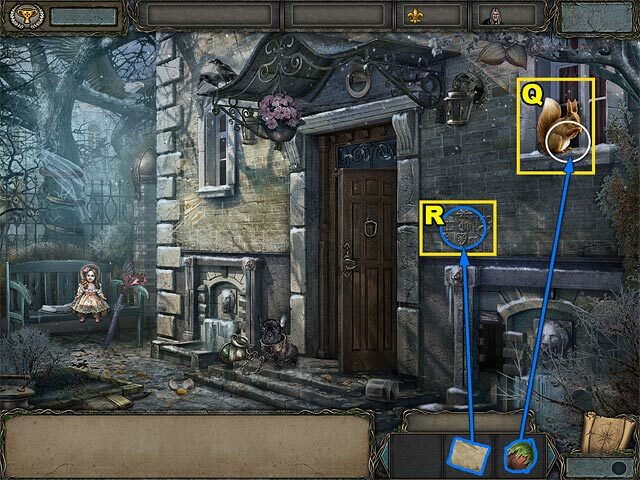 • Use the RULER to open the lantern and take the KEY (C). • Use the KEY to open the door (D). • You’ll enter the house. 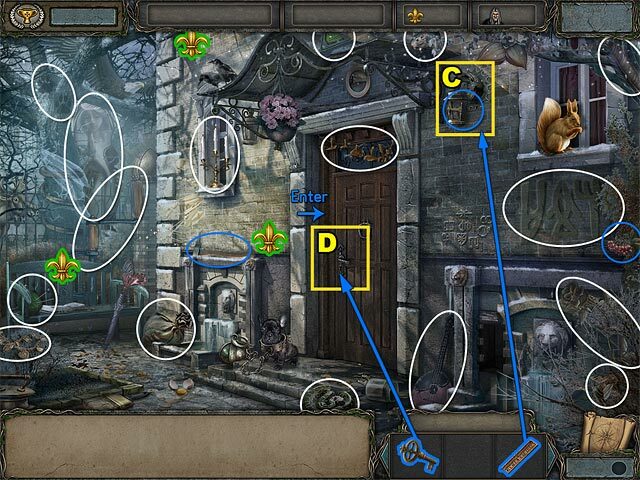 • Collect the KEY, BUTTERFLY, CROWBAR and SCOOP. 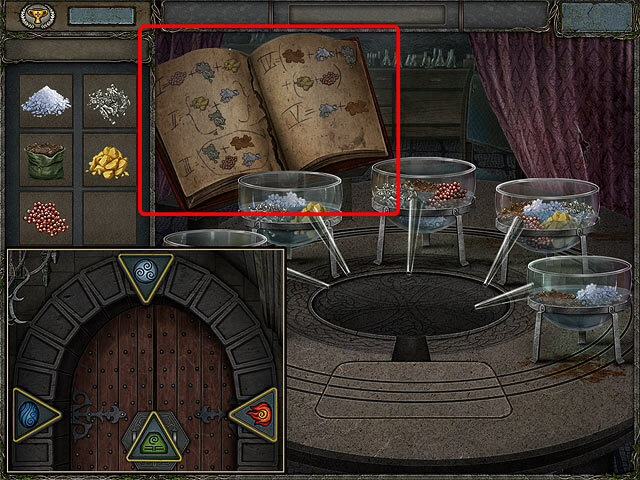 • Move the books to get the Feathers (E). • Use the KNIFE to get the Book (G). • Go to the Workshop. • Use the BUTTERFLY to open the bag and take the Keys (H). • Use the SCOOP to get the Note from the sawdust (I). • Go upstairs to the Garret. • Use the PIN to pin up the cloth and take the Nail File (J). • Use the AXE to open the chest and take the Glove (K). • Go to the Leroy House. • Collect the SPADE, DOVE, PAPER and TONGS. • Move the pillow to get the Map (L). • Give the BERRIES to the bullfinch and take the Glove (M). • Use the CROWBAR to break into Giselle’s Bedroom (N). • Collect the KNIFE and the NUT highlighted in blue. • Add the DOVE to the box and take the Ring (O). 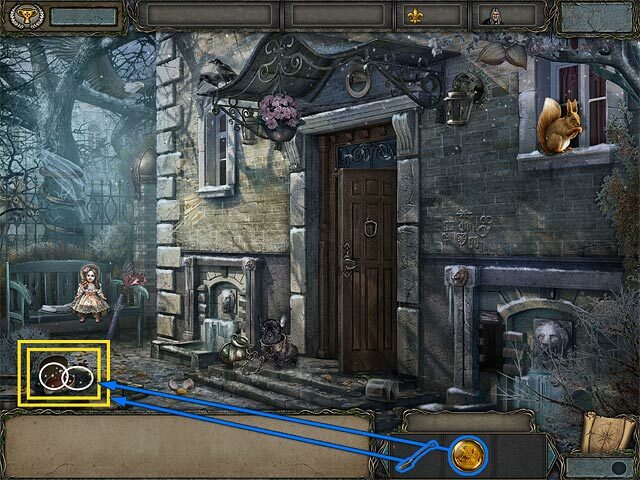 • Click the shelf to play the puzzle (P). 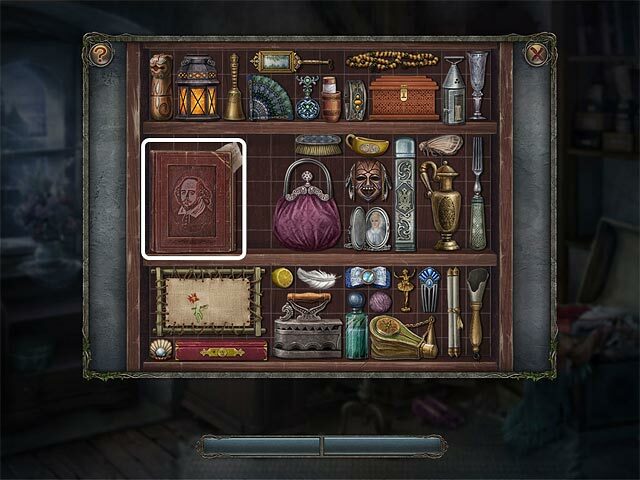 • Move the items on the shelves to uncover the hidden book. • Pay attention to how much space each item needs. 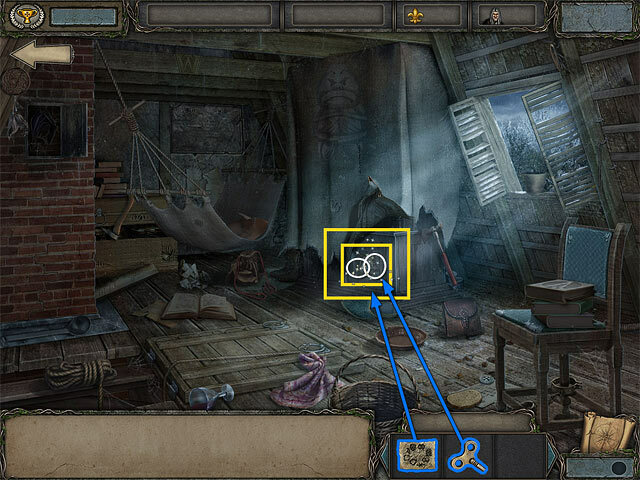 • You can move any of the objects on the shelf as long as there isn’t an object in the space above it. 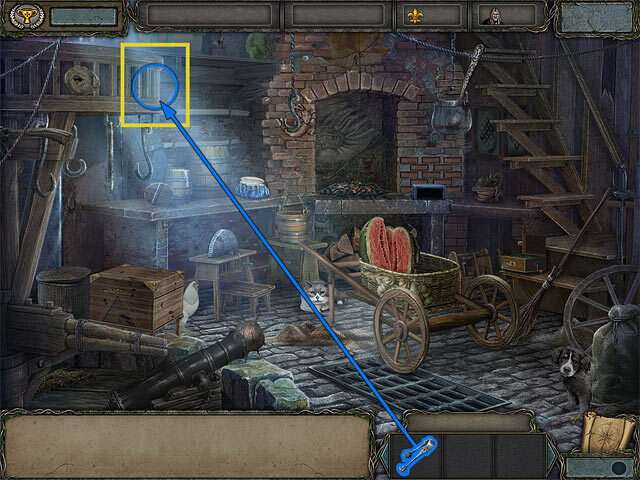 • You can place an item in a space if it’s on the bottom of the shelf or there are other items in all the spaces below. • Rearrange the items so that you can move the large frame from the middle shelf to the bottom one. • Use the screenshot for help. • You’ll go to the Summerhouse. • Use the KNIFE to get the Pouch. • Use the TONGS to get part of the NEWSPAPER. • Go to the Mansion. • Give the NUT to the squirrel and take the Bracelet (Q). 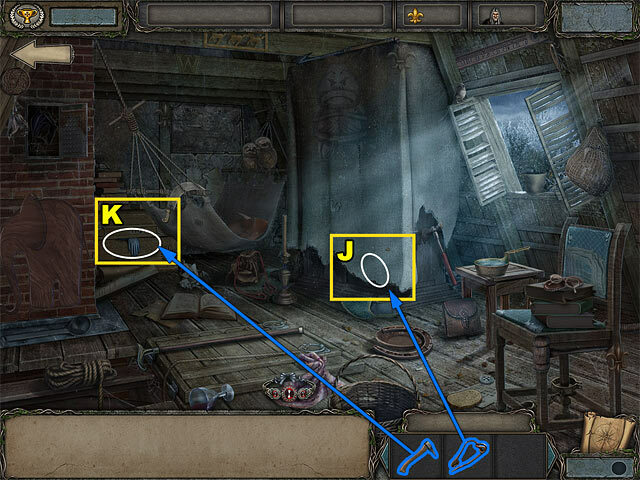 • Use the PAPER to get the Secret Symbols (R). 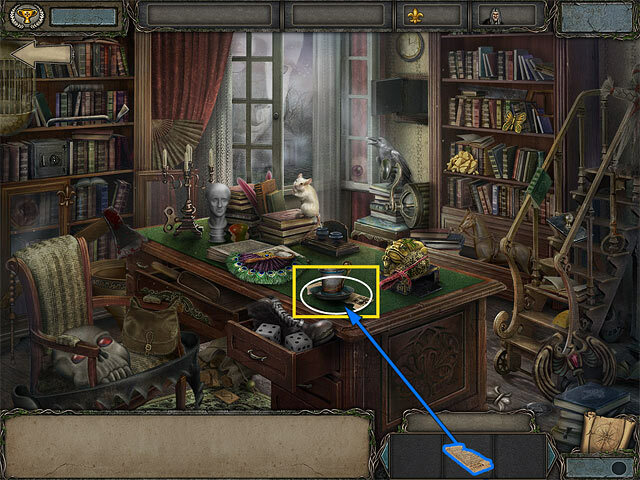 • Dig with the SPADE to find the Jewelry Box. • Add the AMBER to the Jewelry Box. • Find matching pairs of jewels to open the jewelry box. • Pay attention to the colors and the symbols. • Take the Picture and the Salt. • Add the Newspaper to the other half and take it. • Go to the Workshop and upstairs to the Garret. 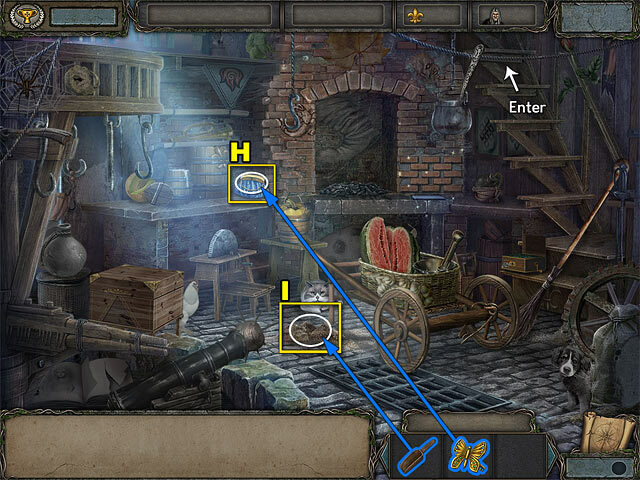 • First, use the PAPER with symbols to reveal the lock. • Use the KEY to open the lock. 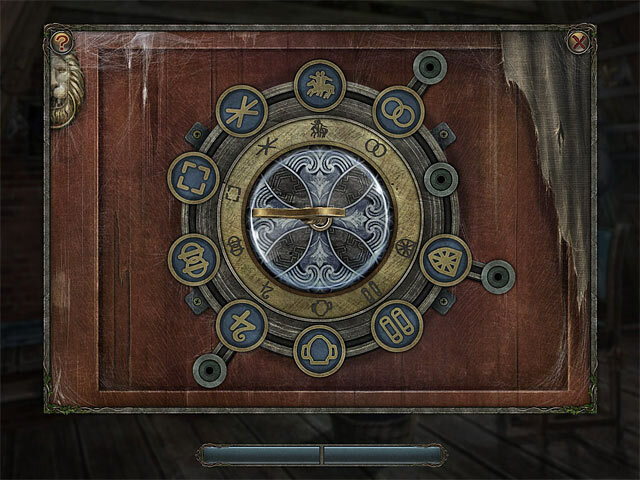 • To unlock the wardrobe, rearrange the symbols so that they match the images on the wheel. 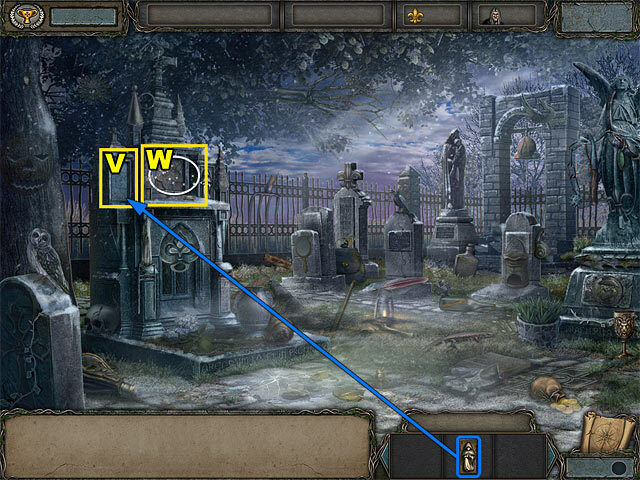 • Move symbols to adjacent empty slots or the slots on the sides of the wheel. • Click the key to rotate the wheel. 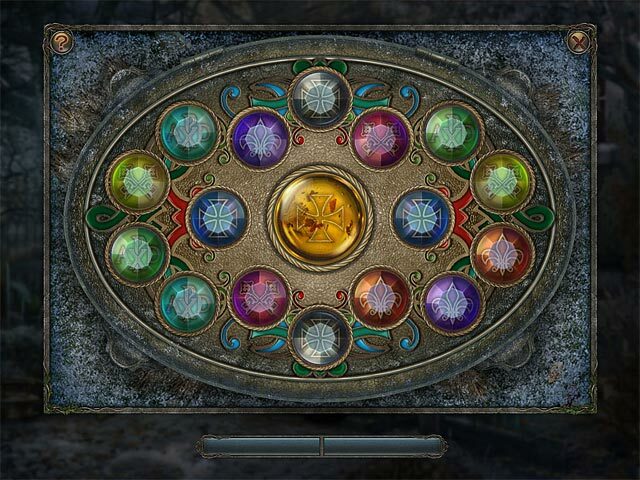 • Put the pieces in the correct order, and then spin the disc until the pieces line up with associated symbols. • Take the Gold Bar and the Recipe. • Go to the Graveyard. 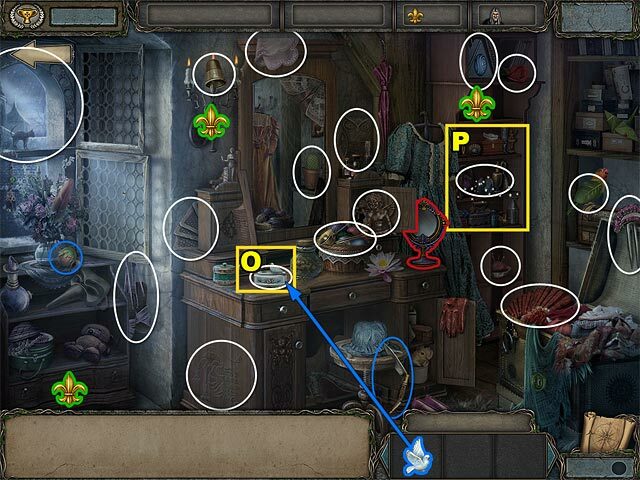 • Collect the GOBLET and the FEATHER highlighted in blue. • Use HOT WATER to get the Monocle. • Go to the Abbey. • Use the FEATHER to get the Ring (S). • Move the papers on the desk (T). • Put the GOBLET on the table (U). 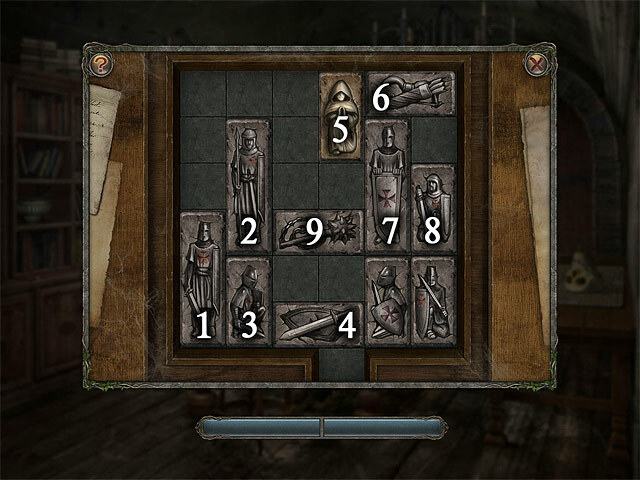 • Slide the tiles until you can move tile 5 to the exit. • You can use the screenshot for help. • Put the CARVING on the tombstone (V). • Play the puzzle (W). 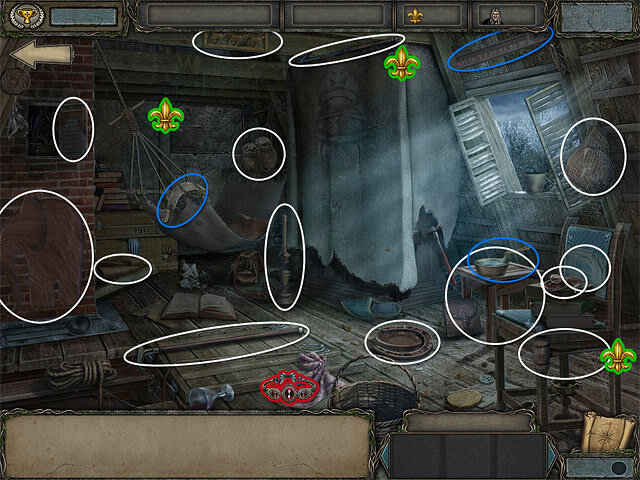 • Rotate the circles so that all sides of adjoining circles match the images. 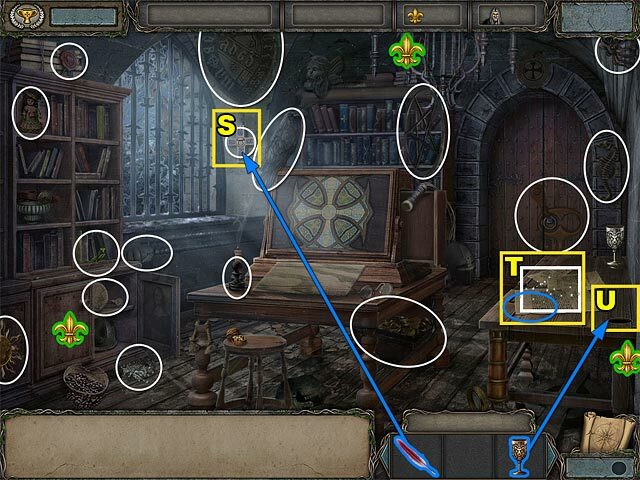 • Rotate the upper right circle so that the empty slot faces the top. • Work clockwise to solve the puzzle. • You’ll play another mini-game. 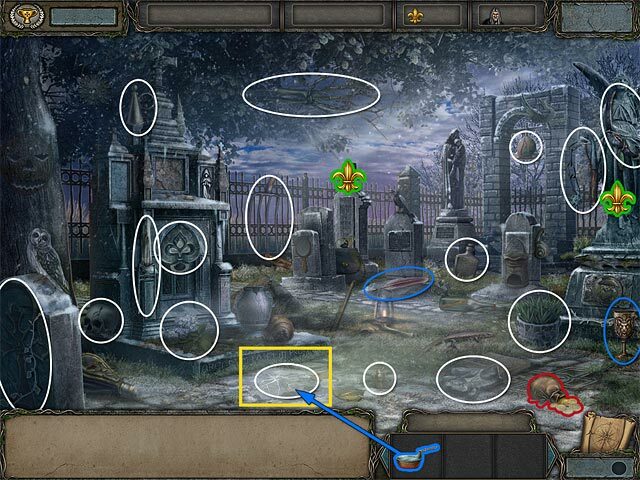 • Put the slabs in the right places by matching each with a corresponding symbol. • Put the required ingredients into each bowl. • Click the ingredient and the correct bowl. • Use the formula in the book for hints. • Take the Gold Map.